Usually the issue is how to stop the spread of the most problematic of the different species, or figure out why the sting is so painful. 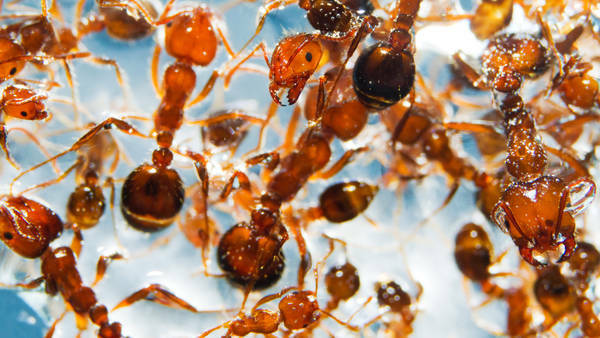 But scientists at the Georgia Institute of Technology, including Zhongyang Liu and David Hu, were interested in the ways that a mass — or you might say, a mess — of fire ants can act like a fluid or a solid, depending on the situation. It’s the first time this duality had been observed in a group of living things. In a presentation at a meeting of the American Physical Society last month the researchers showed video of the ants pouring out of a funnel, like some thick and wriggling syrup, and also springing back into a rough ball shape after being pressed down. These images illustrated the findings of the more technical research, done with rheometers to measure the precise viscosity and elasticity of balls of ants under stress. The researchers found that in different situations the ants behaved differently. The research could have practical implications, Dr. Hu said, for self-assembling robots, which build themselves out of smaller bits and for self-healing materials. In bridge construction, for instance, interest is great in materials that automatically repair cracks. The ants are experts at this kind of repair. When they turn themselves into a bridge for other ants, which they do often, they scramble to quickly repair breaks in any damage to the structure.